Leave a Review or Comment on Getting Better! ***Note: All reviews and comments will appear on the site after administrator approval. You met my father Paul on a visit to Edward Hospital. Like you he has four children; we have all read Getting Better. Do you have book discussion questions available for our book club? Mark, thank you for your visit at Edward Hospital on or about the 20th of February. I would never known about your book or had the joy of reading it. A friend was depressed and you recommended the yellow book in the gift shop. Little did we know you were the author, but figured that out from the wired photo on the back cover. We have since purchased two more copies to give to friends struggling with health issues. The book is well written and an inspiration. I loved ready about your funny antics and having had a career in nursing, you would have been a good patient to help get better. I do believe attitude is half the battle in recovery. Keep up the good work of Getting Better! Faith, Family, Friends, Fitness, and Fun – the five “F’s” which Mark discusses throughout his book. These are 5 areas of our lives that we should all try to “get better” each day, regardless of our individual health status. I really enjoyed reading Mark’s stories in each of these areas and I am glad to know him as a life-long friend. I have always enjoyed giving away my favorite books to share and spark discussions. Every few years there is a book that I keep needing to buy multiple copies of to share . ” Getting Better ” is one of those books ! The feedback I have received from seriously ill patients with whom I have shared the book has been rewarding. Thanks to Mark for reminding us all , patients and caregivers , to laugh while fighting the battle to GET BETTER ! Your book is a great read…humorous, uplifting, humbling, and motivating. I passed it on to my mother who had recently fallen at home, suffered traumatic brain injury, and is now having to live at an assisted care facility. She wasn’t too happy with having to deal with the after effects of her injury or with not being able to return home. She had a very negative outlook on life, was difficult with the staff, and with the family. After reading your book her mental and emotional outlook as changed considerably for the better! Seeing how you were able to deal with a physical illness much worse than hers and how you incorporated your faith into your recovery struck a nerve. All the best to you and THANKS for writing this book! Jim, You are very welcome and I am humbled that GB helped your mom with her outlook on life. That was one of my hopes for those reading the book. Thanks for your comments. “How are you doing?” A simple question with a not so simple answer for those who like Mark, are living with a chronic illness. Getting Better offers a fresh perspective on how to answer this question and more with a healthy dose of humor and 5 simple tips for going beyond mere acceptance of one’s circumstances. We are proud to walk alongside Mark in his journey to overcome sarcoidosis and grateful for his generous contributions towards research. Sarcoidosis is a devastating disease with no known cure. Patients like Mark hold the key to unlocking better treatment options and a cure, and their insights to the debilitating experience as sarcoid sufferers can illuminate the high need for more research. Mark soundly and acutely makes that clear with his stirring yet humorous account of his journey. I’m delighted to be able to help FSR create awareness for this little known disease. 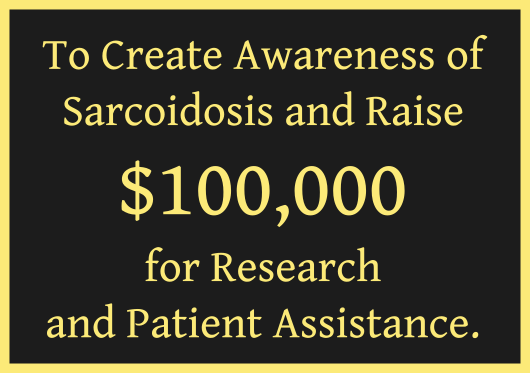 Hopefully, we can help a lot of patients in their quest to get better and raise enough funding to one day find a cure. As a Sarcoidosis patient, I am excited to read your book. It is hard to find others who understand the complexities of this illness, let alone a book from a personal experience. Thank you for taking the time to not only fight the illness, but give of yourself to help others in our situation. Good luck with your all your endeavors!